Home › Blog › Proportionally Perfect! 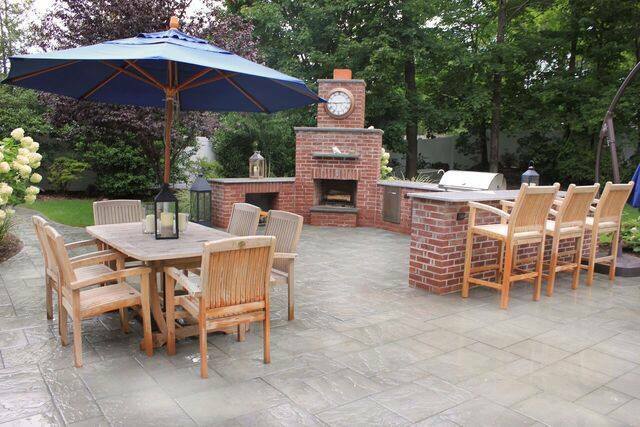 This large, versatile 12 ft. Fireplace and Outdoor Kitchen combo, set on an expansive Cambridge Pavingstones With ArmorTec Cast Stone “Bluestone” patio, is sited to anchor the corner and serves as both a backdrop and a warm, inviting focal point for intimate or larger gatherings. The marriage between the contemporary, polished granite countertops and the old-world charm of rustic Holland-style brick, creates a subtle yet dynamic relationship consistent with the overall design theme.